Dretloh has recently completed the refurbishment of a Boeing 747. 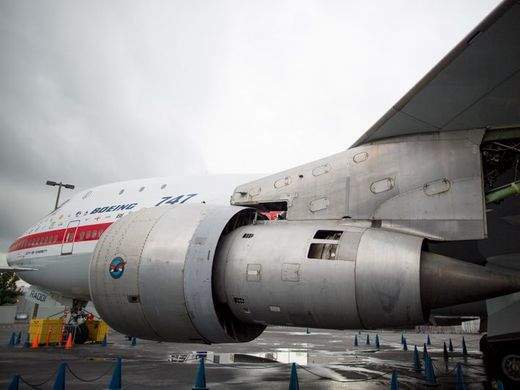 To restore the airplane’s original exterior, crews spent numerous months and more than 15,000 pieces of sandpaper working to strip the old paint. Another 750 foam rollers and 60gal of fresh paint were used to complete the new exterior paint job. The goal was to simply restore the inside to its first-flight configuration and remodel the upper deck lounge. Insulation had to be replaced along with testing equipment. Upholstery and interior fittings from 1969 were installed to recreate the upper deck, including vibrant red sofas, aircraft seats with ashtrays, and linoleum-covered tables. A successful refurbishment or retrofit of a Boeing 747 can take anywhere from 20 to 40 days depending on the scope of work involved. A full overhaul modification can mean stripping the aircraft down to its shell, removing every seat, installing a new in-flight entertainment system, adding in at-seat power outlets and more. This process can take the longest spread of time to complete within that 20 to 40-day range. Any big maintenance session like this one will typically start with the first task being the removal of all seats. Once everything else is removed, the new cabin layout may transform as well. Some commercial aircraft are reducing or eliminating first class cabin areas altogether. Depending on the needs of the client or airline, the first class cabins are offered on routes that serve a demand for it. Crew rest areas along with lavatories and overhead bin space are enlarged to accommodate the retrofitted airplane. New seats, ceiling panels, and many other parts are installed throughout the aircraft. Be sure to connect with an expert MRO team like ours for pricing, timeline expectations, and more. In 1968, the 747 aircraft was the first-ever wide-body jumbo jet built and required more than 50,000 workers and countless hours to construct for completion. The Boeing 747 held the title as the largest civilian airplane in the world until the Airbus A380 was introduced in 2007. Since then, Boeing produced more than 1,500 747s and at least 500 of the originals are still flying the skies today.